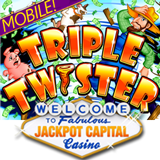 Triple Twister is one of RTG's latest and greatest online slot games and now there's a mobile casino version at Jackpot Capital Casino! Triple Twister is a tornado-themed game from RTG with a Win-Win bonus game feature that makes sure everyone wins during its bonus game. I like the expanding Wild -- an animated tornado that expanded to cover all three reels. Try the new mobile game while you can claim 20 free spins and a deposit bonus up to $150! The coupon code for free spins is MOBILETWISTER and for up to $150 in bonus cash use coupon code TRIPLETWISTER (both bonus codes are valid until July 23rd). It's not that long since Jackpot Capital Casino launched the mobile version of Aladdin’s Wishes. They're adding new mobile casino games as quickly as they can crank them out so I'll let you know when I hear about the next one. To play real money casino games on your iPhone, iPad, Samsung Galaxy or Google Nexus enter m.jackpotcapital.eu in your smartphone or tablet’s browser.